Ana and Jorge got married in Atizapán in the State of Mexico and then had their wedding reception in Salon Lago Esmerelda. We met at a wedding, I was a bridesmaid of a bride who is one of my best friends, and Jorge is her cousin. That day at the wedding reception one of my friend's sisters introduced us on the dance floor, and from there he asked me for my phone number to go out for a date. About two weeks after the wedding Jorge called me to go out, and he picked me up on a Saturday to go out for lunch together. We went to Altavista's Clooneys and we talked about a thousand things for hours! It was an incredible first date!! TELL US THE STORY OF HOW AND WHERE HE ASKED YOU TO MARRY HIM? Jorge is a motorcycle fanatic and has a Harley Davidson, that week he invited me to go out on Saturday to have lunch on the bike because it was a long time since we had gone out on the bike together, the both of us alone. That day, he picked me up at home, and from there we went on his motorbike to eat at a hotel called "Hacienda Cantalagua" in Michoacán, from there we ate at the restaurant in the central garden and once the meal was over he asked if we could go to the motorbike for a gift that he had bought for me. There he sat me on a bench and asked me to close my eyes so he could get out my surprise present, while I was sitting, he adjusted our helmets to put the ring in the middle, then he asked me to open my eyes, he was kneeling with the ring in his hand. He told me how much he loved me and wanted me to be his wife, I said yes and well the rest is history. Actually everything was spectacular but I think the most memorable moments were when we saw each other for the first time in the first look photo session, all the emotion and expectation that we had culminated in that magical moment where we reaffirm that we are for each other. Another moment would be the time we said our vows in the Church. WHAT WAS THE MOST FUN TIME OF YOUR WEDDING DAY? Definitely when we opened the dance floor and we all start dancing. The event began at noon, when Jorge and I began the getting ready at home, with great excitement and expectation. Later we met in the reception area "Salón Lago Esmeralda" for our First Look photo shoot, first Jorge and I, then with family and bridesmaids. There we had our first look that was a wonderful moment. From there we went to the Church to start the ceremony at 7pm, and at approximately 9pm the wedding reception began! The dance floor fill up around 11pm and practically from there we dedicated our time to dancing with all our guests, take advantage of the photo booth and take lots of pictures with EVERYONE. 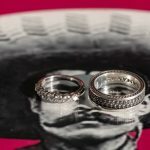 In the early hours of the morning we cut the wedding cake, the ritual of the garter throw and the tossing of the brides´ bouquet, and at approximately 2:30am the mariachis arrived and we continued with a lively party throughout the night. We had the wedding reception closing party from 3:30am to 4:30am with one more hour of music. Really for us, it was a magical night where we could share the occasion with all our loved ones the happiness of joining our lives forever as husband and wife.